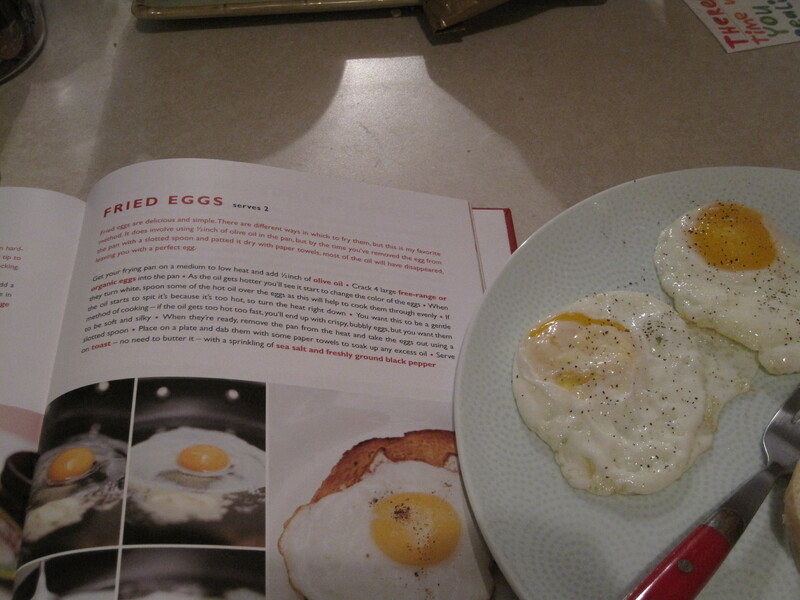 I’m on a quest – to find, or, rather, make, the perfect fried egg. Fried eggs have always been a shortcoming of mine. I mean, they come out okay, they’re edible – but they’re never pretty and there’s always something just slightly “off”. They’re certainly never as good as when my mom makes them, or when I have them at breakfast joints. Today I tried Jamie Oliver’s method. He basically “boils them in oil”, as my mom put it. Which sounds pretty disgusting, but he promises in his recipe (which can be found in Jamie’s Food Revolution) that once you blot the eggs with a paper towel after cooking they’re just fine. I used fewer eggs (2, as opposed to 4) and FAR less oil than Jamie says to use ( he says to use a 1/2 inch! So unnecessary!). Plus I used vegetable oil instead of olive oil because I didn’t have the extra-light olive oil on hand and I didn’t want my eggs to be too olive-y. BONUS FACT: I just learned two days ago that extra virgin and extra light mean two different things! I went with the vegetable oil because I wanted the eggs to be as un-oily tasting as possible, but it turned out that wasn’t quite neutral enough (or the oil taste is inescapable regardless, I’m not sure) because the eggs still had a distinct “hi, I’ve been fried in oil” taste to them, even post-blotting. – do (or don’t) use room temperature eggs – I don’t think it really matters, but I’ve found a couple recipes that have suggested it. Usually room temperature eggs are called for in baking recipes because you need to create a water-in-fat emulsion and introducing cold eggs hinders that process, but I have no idea why it’s supposedly better to use room temperature eggs for egg-frying, too. The only thing I can think of is that room temperature eggs must cook faster, so that’s nice I guess. Anyway, just take however many eggs you want to cook out of the fridge about 2-3 hours before you want to use them, and set them aside somewhere safe until you need them. Another cheat-y thing you can do is put your eggs in a warm-water bath for 20 minutes or so to speed up the process (not too warm or anywhere near boiling though, because obviously that will start to cook the eggs). Or, you know, just use them straight out of the fridge, like I do almost every time. -if you want to make cheat-y over-easy eggs, my mom says to just place the lid over the pan as the eggs are finishing cooking. The steam and heat now trapped inside the pan sort-of cooks the tops of the eggs, and you pull out something resembling, but not quite, over-easy eggs. -use medium to low heat when frying eggs: Jamie suggests this in his recipe above, and Mark Bittman says it helps them stay tender and become evenly firm. Do any of you have any fancy egg-frying tips or tricks up your sleeves? You’re welcome to share in the comments if you do.